So you've decided on a pink wedding theme. Now you just need some pink wedding flowers. Well there's plenty of choice for you. Here's a photo of Cindy just about to leave to set up the flowers at a wedding reception. This wedding had a pink color theme. The flowers here are bright pink gerberas (gerber daisies), stargazer lilies, and roses together with purple lisianthus. 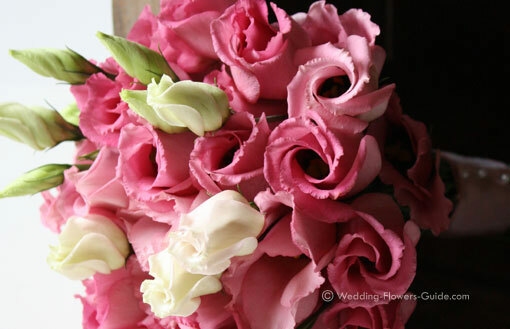 We've created pink rose bouquets for a number of brides. The varieties available range from full-bodied pinks to whites with a pink blush. Roses are a wedding favourite because they look great and commercial varieties will not wilt on you. There is no shortage of variety if you want to have pink gerberas for your wedding. To make a bold statement choose the cerise pink coloured gerberas such as 'Serena'. More subtle pale pinks and dusty pinks are also available. For a subtle pink effect, choose a flower that is predominately white but has streaks of pink in it. This colour combination will work well if you are wearing a pink dress and you don't want to be 'too pink'. Flowers that have this colouring include certain types of cymbidium orchid and lilies. Other pink wedding flowers include tulips, nerine and freesias. There is one small problem with having such a fun and feminine colour as pink. Some gents may not be too happy wearing pink buttonholes (boutonnieres). You can either use a bit of diplomatic persuasion to get him to agree to the colour theme, or he can simply have a white buttonhole. Pink flowers work well in a mixed arrangement when combined with lilac and purple flowers. They also combine well with both light and dark green plant material. White flowers can be used to lighten your arrangement, if needed. Using light and dark pink wedding flowers together also works well. This can be seen in the arrangement below which has two varieties of pink rose.